TE 87 Multi-station Circular Translation Pin on Disc Machine is manufactured under licence from Dr Vesa Saikko, Laboratory of Machine Design, Department of Mechanical Engineering, Helsinki University of Technology. It is based on his Super-CTPOD machine design. 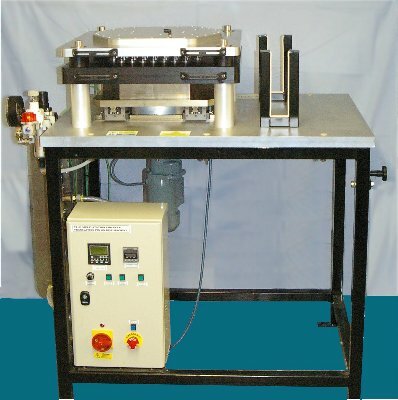 It is a highly compact, cost effective and easy to operate wear test device for the evaluation of prosthetic joint materials. 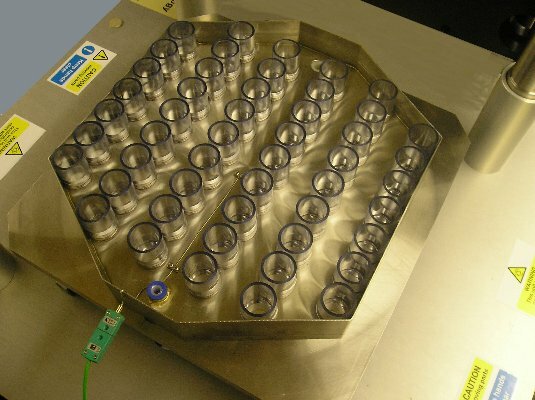 It can be supplied with a total of either 50 or 100 sample test stations. This capacity makes it possible to test many different material combinations simultaneously, under identical test conditions. 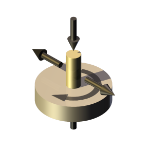 Although nominally a pin on disc machine, the motion is not that of a conventional machine in which the disc rotates about its own axis, with corresponding uni-directional sliding at the pin face. In the TE 87, the disc follows an orbital path without rotation. The pin track may be adjusted to be circular, elliptical or linear reciprocating. This orbital motion following a circular or elliptical path is similar to that generated in multi-axis hip joint simulators and produces wear that correlates well with these types of device and with in vivo behaviour. Typically, for tests with a UHMWPE pin loaded against the Co/Cr disc, the wear is confined exclusively to the pin, with well-rounded PE debris generated, with a size range of 0.1 to 1.0 microns, with the majority of particles of 0.25 microns diameter. The machine is floor standing and comprises a load module, a pin carrier module, a motion module and a test bath. The loading module comprises a plenum chamber mounting 50 or 100 miniature pneumatic cylinders. Air pressure applied to the plenum chamber results in each cylinder applying an equal static load. The pressure is controlled by means of a pressure regulator and the maximum operating pressure of the cylinders is 10 bar. The pin carrier module provides the location for pin carrier rods, each carried in a polyacetal sleeve and restrained against rotation. The loading module mounts on top of the pin carrier module such that each loading cylinder aligns with a carrier rod. The motion module comprises a platform mounted on an x-y slide assembly and actuated by a double scotch yoke mechanism driven by an a.c. gear-motor. The frequency of motion is controlled by inverter and may be adjusted in the range 0.8 to 1.2 Hz. The displacement on one axis is set at an amplitude of 5 mm (stroke of 10 mm) and the amplitude on the orthogonal axis may be set at 0 mm (reciprocating), 1, 2, 3, 4 mm (elliptical orbital motion) or 5 mm (circular orbital motion). The test bath mounts on top of the motion module and provides location for 50 or 100 test disc samples. The pin carrier and loading module assembly is mounted above the test bath bringing each pin sample into contact with a corresponding disc. Flat-faced pin samples, with a recommended diameter of 9 mm (with UHMWPE) are pressed onto the end of the carrier rods, using a simple hand tool provided. Spherical ended samples may also be used if required. Disc samples are 28 mm diameter and may be of varying thickness, but 10 mm is typical. These may be manufactured from a variety of materials as required. Each disc sample is machined with an O-ring groove and with two blind holes for location in the test bath. With a silicone O-ring in place, a short tube of shock-resistant PVC may fitted to each disc to form a local receptacle with a fluid capacity of 16 ml. Typical fluids used are diluted calf or bovine serum, but tests may also be run dry or with alternative lubricants or solutions. The disc samples, with tube receptacles fitted, are mounted on pegs in the bottom of the test bath. No screw fixing is required. Temperature is controlled by circulating water through the test bath and around the receptacles. An integral water circulating system is provided for this purpose, drawing water from the mains supply with a thermostatically controlled discharge to waste. By maintaining a bath temperature of, say, 20 °C, evaporation and degradation of test fluid can be minimized. J Eng Med, 2005, 219, 309-318. Paper # 965 Can Pin-on-Disk Testing Be Used to Assess the Wear Performance of Retrieved UHMWPE Components for Total Joint Arthroplasty?